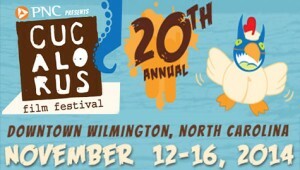 This November marks the 20th anniversary of the popular Independent Film Festival, Cucalorus. With more than 240 films scheduled to be shown between November 12th – 16th, Cucalorus brings together attendees and filmmakers from all over the world to experience the latest creations from established and emerging artists. The films (see website for complete schedule) are divided into multiple categories to help the attendees find the film that they will relate to the most. The newest addition to the categories being Kidsalorus, with Independent films being specified for kids 7 or older. With film screenings at various venues all over the city, this festival is the perfect opportunity to showcase beautiful Historic Downtown Wilmington. Wilmington’s film industry has created opportunities for artists all over the world and without this industry, Cucalorus would not be possible in a city this size. The goal of the festival is to bring people together to enjoy and experience the art form that has had a great impact on Wilmington. In recent years, the C. W. Worth House Bed and Breakfast has taken part in this festival by hosting directors, actors and family of those participating in Cucalorus. C.W. Worth House is your perfect “home base” while taking in all Cucalorus has to offer.